Who is the greatest player ever - Pele or Maradona? It is a question I am asked all the time. Comparisons of playing styles are always difficult, especially when dealing with different eras, but I think I'm on safe ground arguing there has never been a footballer more influential than Alfredo Di Stefano. Di Stefano, who died on Monday aged 88, never played in a World Cup, but club football belongs to him. The world's two leading international club competitions bear his mark - one obviously and directly, the other indirectly. Di Stefano was the last great product of the golden age of Argentine football, the 1940s, when he starred for River Plate. After the big players' strike there in 1948 he was snapped up by Colombia's newly launched league, and helped get the professional game off the ground in that country as the star of the great Millonarios side. And in 1953, at the age of 27, he went to Real Madrid and changed the course of history. When the European Cup - as the Champions League was then known - was launched in the 1955-56 season there was no guarantee of success. World War II was still very recent, though the continent was rebuilding and starting to pull away from post-war austerity. The English authorities were sufficiently suspicious of the whole thing to discourage domestic champions Chelsea from taking up their invitation to enter the inaugural version. 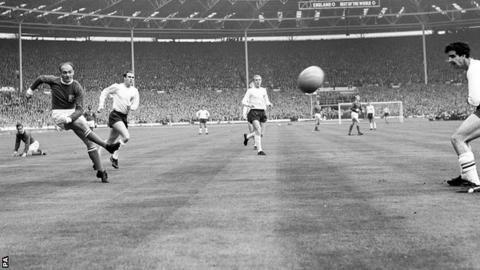 In hindsight, such an attitude appears ridiculous, because it meant English crowds were missing out on the Di Stefano show. Bobby Charlton got a close look in 1957, when he watched from the stands in the first leg of the semi-final, Manchester United away to Real Madrid. "Who is this man?" was Charlton's instant response. "He takes the ball from the goalkeeper; he tells the full-backs what to do; wherever he is on the field he is in position to take the ball; you can see his influence on everything that is happening... I had never seen such a complete footballer. "It was as though he had set up his own command centre at the heart of the game. He was as strong as he was subtle. The combination of qualities was mesmerising." All of Europe was going through the same experience. Di Stefano took the game of football to a level the continent had never seen before. He was not only the driving force behind Real Madrid winning the first five European Cups, he was also chiefly responsible for the quick success of the competition. Everyone wanted to see his Real Madrid side. Just as had happened after Uruguay won the 1924 Olympics in Paris, some South American talent had set off a fever for the game in Europe. If Leeds United wear white, if there is a club in the US called Real Salt Lake, and if the European Cup was an instant hit, then much of the credit belongs to Di Stefano. Some would even argue that as the leading light in Real's galaxy, Di Stefano helped improve foreign perceptions of Spain, thus encouraging the tourist boom and consequently hastening the country's integration into mainstream western European politics following the death of the dictator General Franco. That might well be going too far. But I don't think it is excessive to argue that, without ever intending to, Di Stefano helped bring into life the Copa Libertadores, South America's European Cup equivalent. There were serious impediments to launching such a competition on the continent of Di Stefano's birth - South America is huge and its transport structure, far from perfect even today, was rudimentary. An attempt had been made in 1948 to gather the continent's best clubs for a tournament in Chile - Di Stefano played for River Plate - but although it was a success the timing was wrong; the players' strike was about to erupt in Argentina, which had the effect of forcing the country into footballing isolation and driving Di Stefano to Colombia. So there was no follow-up, and no thoughts of a competition staged on a home-and-away basis - until an invitation arrived from Uefa, European football's governing body. Back on the other side of the Atlantic, the success of the European Cup was making people curious. Could there conceivably be a better team than Real Madrid somewhere out there? Did the continent that produced Di Stefano have any more where he came from? Uefa, then, proposed to the South American Federation that an annual game be staged between the champions of the two continents. All South America had to do was find a method of deciding its champion. And thus was born the Copa Libertadores. Without Di Stefano's exploits with Real Madrid it would not have got off the ground so soon. Read more on Alfredo Di Stefano: Did General Franco halt Barcelona transfer?